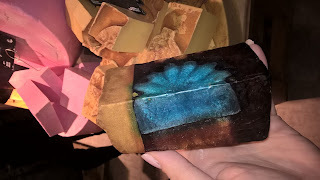 I'm a recent Lush convert, by association of moving to a town where there is a store and my son being overwhelmed by love for their bath bombs shaped like robots. So, when Unique Young Mum asked if I'd like to be her plus one for their event I was very pleased to come along. 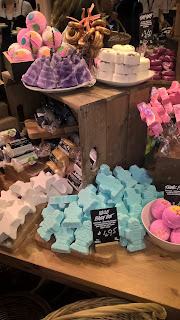 I think the great thing about Lush, certainly my local Lush, is the staff and how much they appear to love their jobs and the merchandise they sell. There is nothing these girls and guys don't know about their products. They are also great at telling you what works for certain skin types too, which is handy with my sensitive skin and Littlest and his range of allergies. Yes, even soaps can cause him to have flare ups and he loves being able to go in store and asking if it's OK for him to use in the bath. The range is just eye popping, with every colour accounted for, the smells are amazing, from earthy hues to flowery scents. If you love something subtle, or like a strong perfume, flowers in the bath or a coating of skin and environment friendly glitter, Lush has you covered. 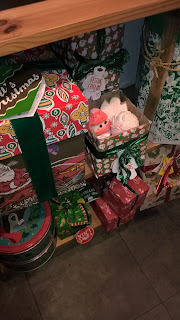 I personally love the gift boxes they currently have for Christmas. Even something as simple as the box is seen as an excuse to go to town. One box doubles as a musical merry go round which you could use again and again without anyone realising it held soaps. There were kid friendly boxes with clowns which can be mixed up. I also liked the soap canon, a Lush nod to the traditional Christmas cracker. They also sell a great range of cosmetics, and hair care too, all of which is not tested on animals, and is as natural as can be. Lush also encourages customers to bring back empty cartons to refill rather than buying a new one and throwing the old tub. 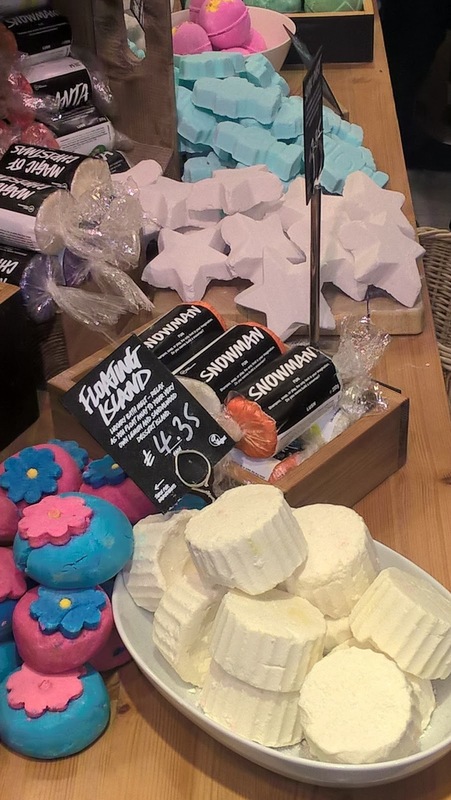 I think if you have a family member of any age and you aren't sure what to buy them, Lush is the answer. Its so nice to receive some artisan bathroom goods, but Lush just looks as impressive as you're going to find and they look so good you almost don't want to plonk them in the bath! They have prices to suit all budgets, and the staff are happy to help you decide if you get stuck. I really enjoyed seeing the new range for Christmas, and now have a rather epic list of must haves!